Wave energy converters (WECs) must survive in a wide variety of conditions while minimizing structural costs, so as to deliver power at cost-competitive rates. 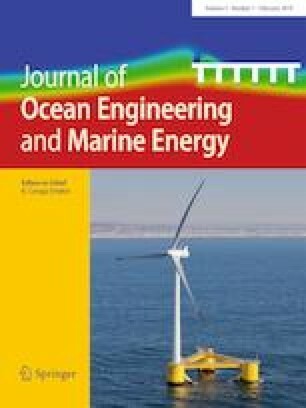 Although engineering design and analysis tools used for other ocean systems, such as offshore structures and ships, can be applied, the unique nature and limited historical experience of WEC design necessitates assessment of the effectiveness of these methods for this specific application. This paper details a study to predict extreme loading in a two-body WEC using a combination of mid-fidelity and high-fidelity numerical modeling tools. Here, the mid-fidelity approach is a time-domain model based on linearized potential flow hydrodynamics and the high-fidelity modeling tool is an unsteady Reynolds-averaged Navier–Stokes model. In both models, the dynamics of the WEC power take-off and mooring system have been included. For the high-fidelity model, two design wave approaches (an equivalent regular wave and a focused wave) are used to estimate the worst case wave forcing within a realistic irregular sea state. These simplified design wave approaches aim to capture the extreme response of the WEC within a feasible amount of computational effort. When compared to the mid-fidelity model results in a long-duration irregular sea, the short-duration design waves simulated in CFD produce upper percentile load responses, hinting at the suitability of these two approaches. This material is based upon work supported by the U.S. Department of Energy under Award Number DE-EE0007346. Sandia National Laboratories is a multi-mission laboratory managed and operated by National Technology and Engineering Solutions of Sandia, LLC., a wholly owned subsidiary of Honeywell International, Inc., for the U.S. Department of Energy’s National Nuclear Security Administration under contract DE-NA0003525. This work was authored [in part] by the National Renewable Energy Laboratory, operated by Alliance for Sustainable Energy, LLC, for the U.S. Department of Energy (DOE) under Contract no. DE-AC36-08GO28308. Funding provided by the U.S. Department of Energy Office of Energy Efficiency and Renewable Energy Wind Energy Technologies Office. The views expressed in the article do not necessarily represent the views of the U.S. Department of Energy or the United States Government. The U.S. Government retains and the publisher, by accepting the article for publication, acknowledges that the U.S. Government retains a nonexclusive, paid-up, irrevocable, worldwide license to publish or reproduce the published form of this work, or allow others to do so, for U.S. Government purposes.